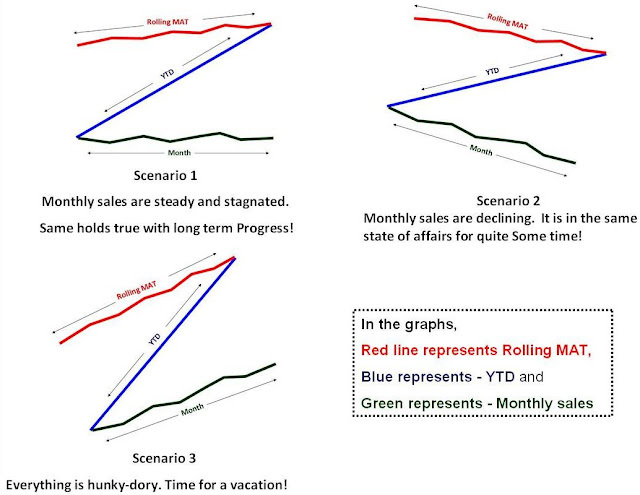 Short, Medium and Long-term Sales analysis - All at once at a Glance ! Sales progress is best shown in graphs. Here is a consultant's style of showing Long-term, Medium-term and Short-term sales progress - all in one graph. All you need is, sales data for this year till this month, and past 12 Months of sales data. The magic of the graph is it not only throws light on long-term, medium-term and short- term, it also can show how good is your near future going to be! This is called "Z" Graph. Bring all the data on to a single graph, it becomes a Z-Graph. Do not undermine the Graph, the shape of “Z”, the angle inclination, slope of arms of “Z” can through new insights. “Z” Graph is best for sales dashboards. Just to stir your thoughts, here I present you 3 scenarios! The shape of the “Z” should give you complete picture. If the shape of "Z" is... as shown in the picture, it is obvious that risk is a head unless you have a strategy to defy the trends! One visit to David Straker’s sites will make you a regular visitor. Syque (pronounced 'sike') is my knowledge sharing site. My purpose is to share knowledge and understanding on an unprecedented scale, adding real value for individuals and companies. Consider it as 'original books on the internet', with already over 7,000 web pages of industrial-strength knowledge freely available. "Even better if you add the year to date sales target as an extra line. I have used Z Charts for many years and they are one of the clearest ways to show how performance is trending against target." So added another sheet to Excel showing YTD achievement along with YTD Target. Updated On 13'Oct' 2012"